Public vote 3d place winner on EBWC challenge. Beaded bead necklace made with hematite round beads, cherry round beads, cherry, iris brown, dark copper, bronze Toho seed beads and Sterling silver S clasp. Necklace - 17,5" / 44 cm, Czech beads, Swarovski crystals, cabochon, handmade toggle clasp. 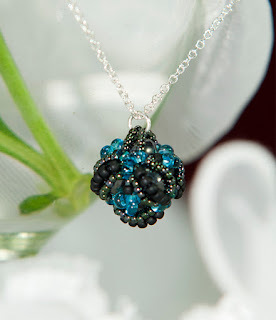 A unique beaded bead pendant made with gunmetal round beads, jet matte and gunmetal Toho seed beads, light blue drop seed beads and Sterling silver chain 46cm (18").